I thought this was a widely known feature, but some friends were absolutely amazed by it the other day so that tells me maybe it’s only the more savvy of us who know about this. The feature works the same on an iPad, iPhone, or iPod touch, and Google Maps on the web, you just need internet access of some sort to use it. 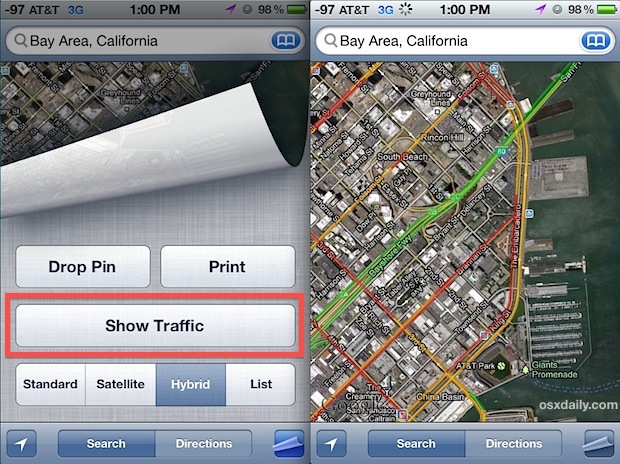 The feature should work just as well in iOS 6’s new Maps app, though when Google releases their own app it may be a good idea to download that as well. Where is the Traffic Data Coming From? You! Well, you and every other iPhone, Android, Blackberry, WindowsPhone, and every other smartphone user really. Google takes anonymous location data from GPS equipped cell phones and uses it to calculate traffic speeds and congestion, the result is an incredibly accurate crowdsourced picture of traffic that is updated live 24/7. Don’t plan a trip without it! Why do you guys post these tips? I’m sure everyone knows most of the tips you guys post, especially since iOS has had these features for quite some time. You should post tips that are more useful/advance. Thanks! You have an opinion, good for you! discovered that the iPhone will actually play music! LOL that’s exactly what I mean!!! Yeah this can be a weird mix of incredibly complex/ technically specialized tips and grandma’s-first-phone tips. I don’t think this true? or at least 100% true. I also believe there to be roadside sensors that gather data that google and the other map applications have access to. Do search there are various web sites the at talk about it. I was wondering the same thing but sometimes the info is good but then yesterday I’m stuck in gridlock, checked the iPhone traffic and it was showing smooth sailing. My only guess is that no one else was checking the traffic on their phone or the accident down the road had just happened. I didn’t know about this feature, but since I’m red/ green color blind, it will be mostly useless for me. My tech savvy friend who has had an iphone from day one was truly amazed when I showed him this about a month ago. Just coz you know it, doesn’t mean it shouldn’t be shared sometimes. I find the data very accurate. 99% of the time, it’s correct, right down to the nearest intersection/ point on hwy. Does anyone know how to block the alternative routes? That’s what I’ve been searching for.